Looking to Increase Your Team’s Productivity and Engagement? 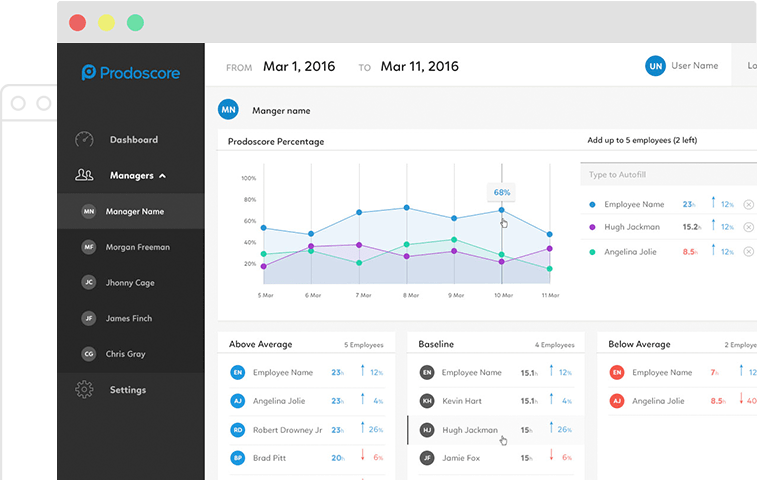 With Prodoscore you can capture and measure real time data about your team’s productivity and engagement. Employees learn where they can improve and managers can discover and improve on their teams weaknesses. Also, HR can receive alerts for at-risk employees. Prodoscore provides deep visibility to your daily workflow which helps you continuously improve work process for your whole team, and via machine learning surfaces creates new opportunities you may have missed. See how much time is spent in G Suite applications, such as email, docs, hangouts, and calendar events as well as your CRM to coach performance improvement and reward efforts. Prodoscore takes employee activity spent while working in G Suite business applications (mail, calendar, docs and hangouts), Your CRM, and phone system (dialer, conference calls, and text messages) to build a simple visualization of your productivity. Based on their level of activity, and our secret sauce, each employee is given a unique Prodoscore (productivity score). Quick analysis of this score, and our machine learning, identifies areas for proactive coaching and increased sales productivity. We also enable remote work for sales teams and provide HR metrics for your business. We use the cloud to capture data in near real-time and displayed in a way that is easy to see, manage and understand. Seamless integration with G Suite APIs (mail, calendar, docs and hangouts) ensures deep data collection and the highest level of accuracy. Consistent measurement across the team provides insight into engagement and accountability for teams, managers, and HR. Prodoscore is quick to install, so it can deliver sales activity intelligence within hours of implementation. We'll show you how sales activities can be accurately measured – in near real-time – to help you reach your goals. We'll walk you through where you’re currently performing, create new goals, and use Prodoscore as your proactive coaching tool to help you reach them. We're experts in G Suite and business tool integration. Our world-class onboarding and support teams will make set-up, data collection, and analysis a breeze. Want to see how Prodoscore can improve productivity at your company?